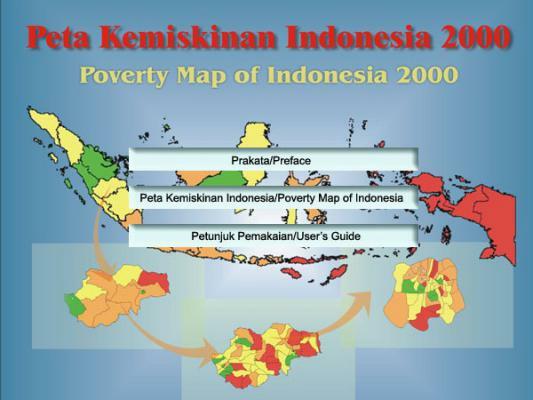 In light of the need for reliable poverty figures at kecamatan and village levels, in 2005 The SMERU Research Institute—with the support from Ford Foundation—developed the Poverty Map of Indonesia 2000, the first poverty map of Indonesia which estimated poverty rates down to the village level. The estimation combined the information obtained from household surveys—collected from National Socioeconomic Survey (SUSENAS)—with information collected through the population census (Sensus Penduduk) and village census/Potensi Desa (Podes). The model used to estimate poverty rates down to the village level in the map is a provincial urban/rural model (totaled to 53 estimation models).